Submitted by Alexander Briones on Dec. 10, 2018. First published on May 13, 2016. and last updated on December 11, 2018. 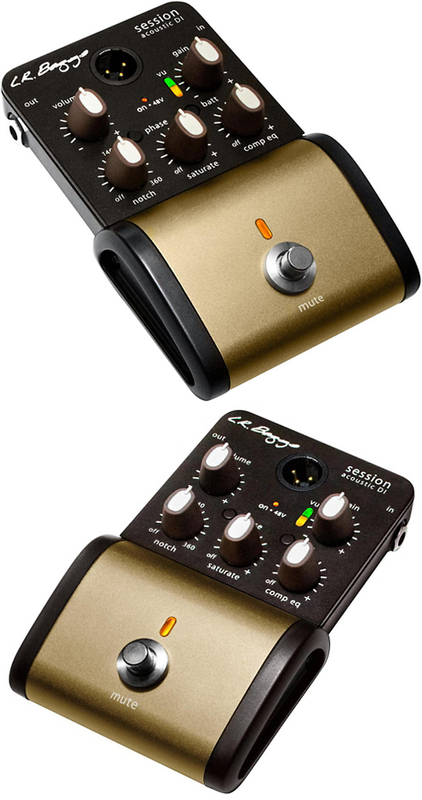 Preamp pedals are often employed for the good tone coloration that they provide. They are often used to tweak the sound in order to make acoustic instruments sound more natural. Here we present you with the best of them, based on the most recent reviews and ratings data up to December of 2018. If you want to bring your sound directly to the mixing desk then you'll absolutely need the preamp to act as a Direct Input (DI) which all of these do. Note that we are talking about preamp pedals, not onboard preamps that are mounted inside guitars and other instruments. If you have an onboard preamp in your guitar you can plug it straight into an instrument amplifier but many find the improvements of these dedicated preamp units are just too good to do without. Not much has changed for this update, aside from shortening the recommended list to feature only the elite ones that deserve your consideration. What are you looking to play through? 94 out of 100. Incorporating 425+ ratings and reviews. 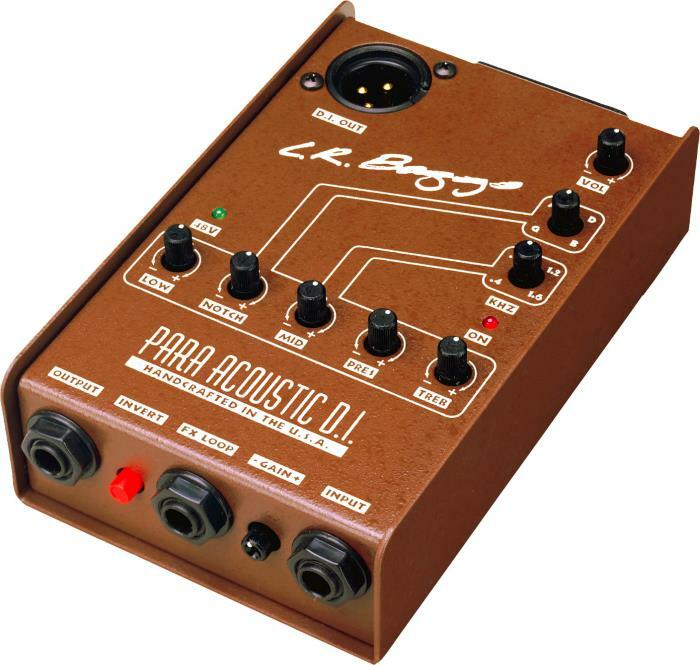 The LR Baggs PARA DI is a versatile acoustic preamp that can be used on the floor or on a desk, thanks to its compact form factor. This unit has a 5 band EQ with tunable notch and midrange bands provide extensive tone shaping. It is usually employed for subtle adjustments to fix venue related sound issues, or even to change the sound altogether. Other practical features include feedback control via phase inversion and the option to power the unit via a 9V battery or via phantom power. LR Baggs is well known for the quality of their gear, and the LR Baggs Para DI is a great showcase of what their brand is all about. Many report that it improved their sound significantly, this include satisfied guitarists, musicians who play violins and other pickup-equipped acoustic instruments. Many are impressed with how the preamp brings out details that otherwise would be lost. In addition to sounding better, many also claim that it makes them play better. It continues to rate highly for its great overall sound and functionality. Some users mentioned that they encountered feedback issues during the first few uses, until they learned to better utilize the notch filters. Others pointed out that the learning curve for maximizing its potential is a bit steeper than expected. There are also a few who wished for the price to be a bit lower. If you're a multi-instrumentalist that play various acoustic instruments, then the portable and versatile LR Baggs Para DI box is highly recommended. Fire-Eye is a boutique brand that may not be as popular, but they are gaining traction in the market, with more and more musicians swearing by the overall quality of the Red-Eye. This preamp and it's bigger sibling, the Fire-Eye Red-Eye Twin, have received exceptionally high ratings, in fact it is difficult to find any expert or customer review rating it at the equivalent of less than 4 out of 5 stars. Input Impedance: 1 million ohms, maximum 1 volt peak-to-peak level. ¼ inch output and input for accessory loop. Dimensions: 1.25" x 2.25" x 4.25"
Sonic transparency continues to be well cited in customer reviews. Ease of use also gets mentioned, with the phrase 'plug and play' coming up frequently in reviews. 'Professional' or words to that effect are in many user reports. The boost button came in for a lot of praise by finger pickers and those who like to switch between playing rhythm and solos on their acoustic guitar. Usually with a product that's becoming as popular as this is, there will be at least a small minority who express some degree of buyer's remorse, however no sentiment like that was evident when I was researching the Red-Eye. There were few, if any, consistently reported negatives. One user lamented the fact that you have to unscrew 4 screws on the back to change the battery, however they quickly added that this wasn't a deal breaker. A couple of others suggested that it would have been nice to have included gain control to make it easier to use with hot active acoustic pickup systems, but even these people didn't rate it less than 4.5 out of 5 stars. If you're looking for a no-nonsense preamp and DI with very good clarity and transparency, then put the Red-Eye at the top of your shopping list. LR Baggs bags retains another spot in this list with the Session DI, a compact acoustic preamp solution that allows for complex tone shaping with minimal knob tweaking. It features intuitive control knobs that let you adjust selective resonance filtering, multiband compression and saturation, all of which are tweaked to work well with acoustic guitars and other pickup equipped instruments. Other controls include volume and gain knobs, as well as a phase button and a mute footswitch. Finally, there's a colorful VU meter on the face of the unit that lets you monitor and optimize your instrument input level. There's just something about LR Baggs' preamp design that makes them sound really good, and this continues to be the majority opinion even after we analyzed the most recent reviews and ratings. It is commonly used to improve the sound of what otherwise would be a thin sounding acoustic instrument. Even those with already good sounding instruments use it subtly for added warmth. Its compression and saturation also received a lot of commendations for its studio level quality, especially when considering its compact profile. As expected from a premium brand, the price for this small pedal can be a bit daunting for some, while others wanted a bit more features to make it worth their money. The clarity and warmth of the pedal makes it ideal for fingertyle playing, but with some tweaks it can work just as well with other styles. If you're looking for a quality preamp that's easy to use, compact and versatile, then get the LR Baggs Session DI Acoustic. 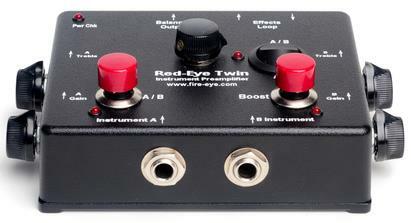 As the name implies, the Red-Eye Twin packs two all-analog Red-Eye preamps into one compact unit. It is meant for musicians who switch between multiple instruments in gigs, simplifying instrument switching while providing transparent high-fidelity preamplification and DI-box functions. It has two inputs for two instruments, with dedicated gain and treble knobs. There's also a switch that lets you switch between instruments or use them simultaneously. There's not much to work with in terms of tone shaping, but it does have a clean boost footswitch for emphasizing certain musical lines. Dedicated Gain and Treble controls for each instrument. Internal filtering for interference rejection. Dimensions: 1.25" x 3.5" x 4.5". One user summarizes market sentiment nicely by saying that the Fire-Eye Red-Eye Twin is a "very well thought out unit". It gets a lot of commendations for its transparency and simplicity, while others were happy with how it helped them organize their rig when using two acoustic instruments. Many of the positive ratings were from acoustic guitar players who also play other acoustic instruments like Mandolin. There were a few who wished for more tone shaping controls, but that defeats the Fire-Eye Twin's simplicity. The Fire-Eye Red-Eye Twin is highly recommended for multi-instrumentalists who switch between acoustic instruments in performances. With its long list of well known artist endorsers that include James Taylor, Jerry Douglas, Keb' Mo' and more - there's just no way to miss out on this in a best preamp for acoustic instruments list. It combines tone shaping for acoustic with Radial's acclaimed preamp quality, resulting in a versatile and clean sounding preamp that is loved by many. Our December 2018 update still shows the Tonebone PZ-Pre's ranking well with good reviews, thanks to its versatile input/output features and its great sound. It is perfect for singer-songwriters or musicians who switch between two or more instruments in live performance. Many also commended the tone shaping ability of the pedal, with some noting that by following suggestions from the manual, they were able to get great sounds. 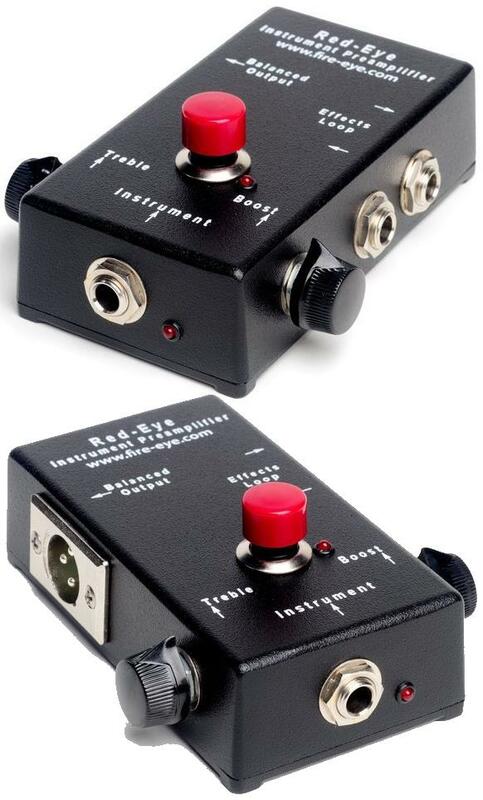 Since this pedal is from Radial, don't expect much coloration, so it won't necessarily make you sound "better", but will simply make more details clearer. Since it focuses more on transparency instead of modifying your sound, it can't really save an instrument or rig that doesn't already sound good in the first place. And this is most probably the reason for some of the negative ratings that the unit received, which is unfair considering that this pedal works wonders for majority of its users. Another issue that came up is the unit's price and bulk, but since it gives you 2 channels, tone shaping and complex DI Box features, it should be easily forgivable. 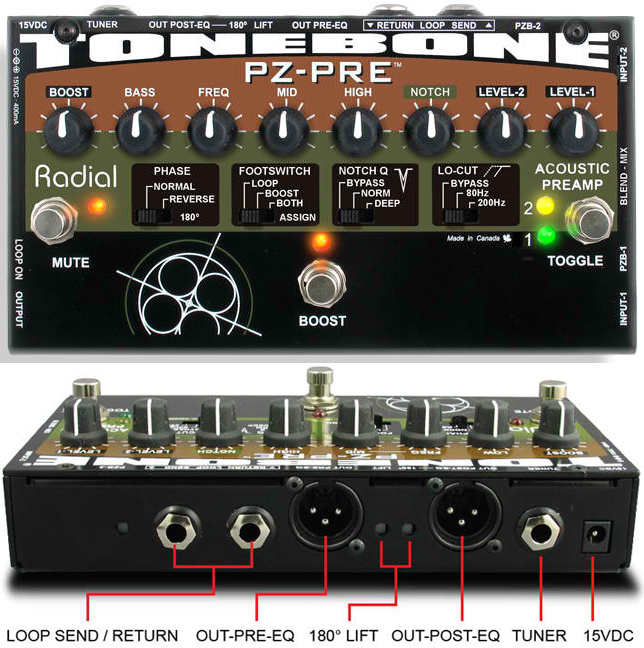 If you're looking for a powerful transparent DI Box solution for your acoustic guitar or other acoustic instruments, then the Radial Tonebone PZ-Pre Preamp D is definitely worth checking out. 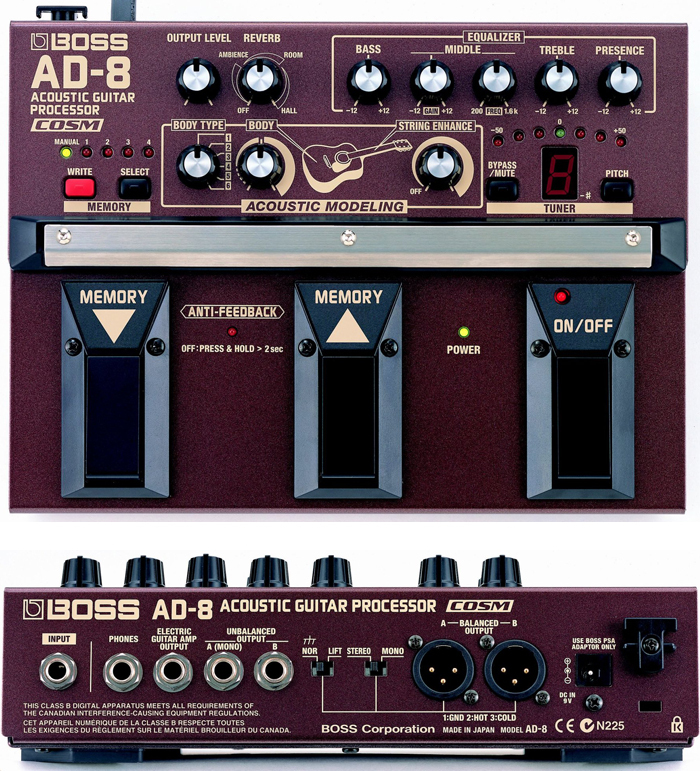 Boss has a tendency of going for the extreme when it comes to adding features into their guitar processors, and this rings true with the AD-8. This preamp packs quite a lot of sounds, equipped with COSM acoustic guitar modeling technology which morphs your guitar sound to be similar to the miked sound of an expensive and sought after acoustic guitar specimen. In addition, it has built-in reverb and a 4-band EQ which gives you even more room to tweak your amplified acoustic sound. The majority of users are happy with how the Boss AD-8 made their guitar sing, adding upper harmonic sparkle and dynamics that would normally only be available when an acoustic guitar is miked. There was even one who reported using the AD-8 for years, with various guitars and pickups, to his satisfaction, made possible by the wealth of tone shaping features that the unit has. There were some guitarists who play nylon strings who also provided their 5-star approval, saying that with some tweaking, they got their instrument to sound organic. Another commonly mentioned positive feature of the AD-8 is its reverb, which works well regardless of the instrument you're using. Of the few low ratings, their main point of contention is the addition of COSM guitar modeling feature. But other users have pointed out that with some patience, it can give desirable results. Another complaint that was raised is its lack of chorus, which the older and cheaper versions had. Some experienced users also mentioned the lack of attenuation setting, which can help better balance out the sound when connecting direct to PA.
Having weighed all the pros and cons, this is still a great acoustic guitar preamp that many recommend, so if you have the patience to tweak and you're looking for a reliable preamp then this is definitely worth checking out. Here's where we present a lower priced alternative for those on a tight budget.. 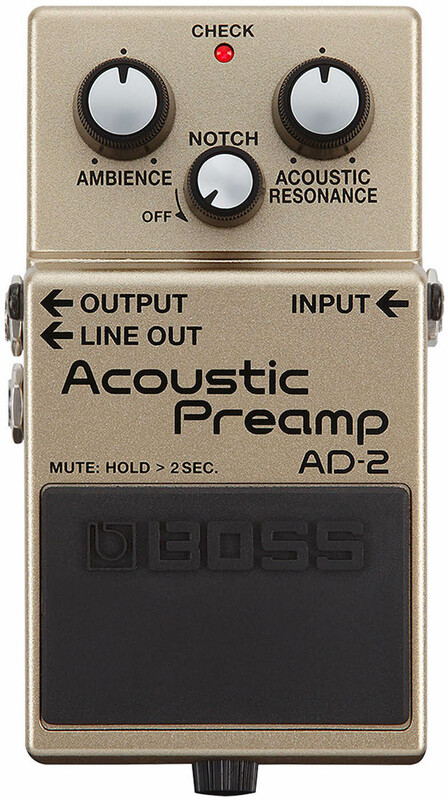 There's no denying Boss' dominance in the compact pedal market, and the Boss AD-2 is an acoustic preamp that showcases their best traits - reliability, quality and affordability. It is a preamp housed the company's familiar and sturdy stompbox form factor, featuring three knobs that are easy to operate. But don't make the mistake of assuming that this is a simple pedal, because the Acoustic Resonance knob adjusts multiple parameters via a digital processor, that results in a more natural acoustic tone. The ambience feature is also a nice plus, adding reverb to improve the sound of your guitar. Add to that the pedal's Notch filtering and you have a nice acoustic preamp package that's very reasonably priced. Market response is quite positive, with many pointing to its quality and value for money being its stand out feature. It also helps that it's compact and in a shape that's familiar with many guitarists. It's simplicity and sonic flexibilty also impressed many musicians. The most common complaint is its lack of an XLR output, but it does have a balanced 1/4" TRS line out that can be plugged into PA systems. While the Boss AD-2 is highly recommended for those with budget constraints, with its reliability, it can also be a good spare acoustic preamp for those with more expensive units. Acoustic Electric guitars that have inbuilt battery powered preamps are mostly of this type. You can get by without a preamp (unless you want to plug straight into the mixer) but many players use them to shape the tone and get rid of the dreaded 'Quack' sound the piezo's tend to produce. These are the kind that attach to an acoustic instrument to pick up the vibrations without built-in electronics. Examples are acoustic guitars, banjo, cello, violin/fiddle, mandolin, contrabass, bouzouki, lute and many more. They need higher impedance inputs to produce a decent sound. At least 1M Ohm is required and 10M Ohms is recommended which is more than most amps or standard guitar pedals provide. These behave much like the pickups found on electric guitars and you can plug them straight into ordinary pedals or an amp. As a result they can sound a bit more like an electric guitar and many players choose to use a preamp to emphasise the acoustic sound of their guitar. This is where acoustic preamps are essential and their tone shaping shines. Firstly you'll need a preamp to at least act as a DI to connect to the XLR mic inputs of typical desks. Acoustic Preamps are much better suited to shaping the tone of acoustic instruments than the options on a mixing desk. They also allow you to bring out the sound of your instrument best rather than relying on last minute tweaking on the mixing desk. You don't strictly need a preamp if you already have an onboard preamp or a magnetic pickup, but you can still use it to shape and improve tone - as many professionals do. It is a must if you have a passive Piezo pickup. Ideally, preamps are meant to just amplify the natural tone of your instrument, but real world scenarios require you to tweak the sound to get the better results. EQ and other tone shaping options are good features to look out for, since they allow for sonic flexibility, be it for adding subtle warmth, or for dramatically improving the sound of your instrument. There's nothing more annoying than having to deal with unwanted feedback in the middle of performing. If this is a concern you'll want an acoustic preamp that can help you deal with feedback, look for those that can automatically/manually block feedback. These use notch filters to suppress the specific frequencies that the feedback is occurring on. Strictly speaking Active DI's (not passive) are preamps and they fulfill the same basic function. In this article we've focused more on the tone shaping pedal based preamps. We started by looking at readily available acoustic preamps in the US market. We then limited our scope to preamps that are specifically designed for acoustic guitars and other acoustic instruments, and we narrowed down our search to only those with pedal style profile. We then gathered all relevant ratings and reviews, including the most recent ones up to December of 2018, along with professional recommendations. All these data were then fed to the Gearank algorithm which provided us with a close numerical representation of how each acoustic preamp has been received by the market. We used these scores to come up with the best acoustic preamp pedals that we recommend above. Finally, this list also has a budget option for those who are working with limited funds. For more information see How Gearank Works. Submitted by John Moody (not verified) on Jul. 7, 2016. Why did you not include the LR Baggs para DI? It would have been a good review with the LR Baggs para DI in the test. Submitted by Jason Horton on Jul. 7, 2016. The LR Baggs Para DI currently has a Gearank score of 92 (I just updated it today) which means it will very likely be included when we do our next update of this Gear Guide which is scheduled for later this month. We have updated the list to include the LR Baggs Para DI, indeed it deserves a spot on this list. Submitted by Paul Simmons (not verified) on Sep. 6, 2016. How about including the Fire eye Red-Eye? Submitted by Alexander Briones on Sep. 7, 2016. I've read a lot of great things about the the Fire Eye Red-Eye, unfortunately it did not meet our criteria for availability, where it should be available from major music gear retailers. Submitted by Joseph R (not verified) on Sep. 8, 2016. What are your thoughts about the LR Baggs Session? The LR Baggs Session DI initially had a spot on this list with its Gearank score of 86, but it was replaced by the better ranked LR Baggs Para DI. From the data we gathered, the Session DI's compact size and deep tone shaping controls were well loved by users. Although there were some that complained about the complexity and the price tag. Still, it's an easy recommendation if you prefer the stompbox form factor, and want a good handle of your amplified sound. Submitted by Jason Horton on Sep. 10, 2016. Here's meta-review of the LR Baggs Session DI Acoustic Preamp. Submitted by Steve (not verified) on Sep. 28, 2016. Submitted by Terry (not verified) on Nov. 21, 2016. Do you know anything about the boss AD5 ? Could it be used with a BBE acoustimax or does it have to be separate? Submitted by Bernd Lüdtke (not verified) on Mar. 6, 2017. Headway EDB2 has been long enough on the market to give it a mention. Submitted by Jason Horton on Mar. 6, 2017. I have added the Headway EDB-2 to our database. Although it got mixed reviews from some customers, it has to be said that Bob Thomas gave it a very good review in Sound on Sound. Submitted by D. Simmons (not verified) on Mar. 8, 2017. Fire-eye Develoment Redeye. Pros all over Nashville are using this. Solid company, rock star preamp. Super simple but clean with TONS of headroom. And, XLR phantom power and 9v to boot. Built like a tank. They have a 2 channel version also. Submitted by Jason Horton on Mar. 8, 2017. Thank you very much for reminding us about Fire-Eye. Originally they didn't meet our availability criteria because they're not sold through any of the specialty major music gear stores, however we've since relaxed our rules to include brands that only sell direct or via Amazon so I've added the Fire-Eye Red-Eye at the top of the list. Submitted by john (not verified) on Mar. 17, 2017. Grace Design AliX (or FeLIX), outstanding sound, just like their mic pres. Submitted by Ben (not verified) on May. 25, 2017. Do you know of an alternative to the K&K Trinity preamp? The K&K stereo (2 channel) preamp only takes a 9 volt battery (no AC or 48V option) and requires a DI box between the preamp and a PA (board/interface). So I'm looking for something that it accepts a TRS (stereo) signal and then allows for shaping of each channel independently. Plus if the alternative has an XLR (DI) out. Submitted by Jason Horton on May. 29, 2017. I did some of the work on this guide and I don't recall seeing anything that resembled your requirements from any of the major manufacturers. Submitted by Anonymous (not verified) on Nov. 17, 2017. Submitted by Jim (not verified) on Jan. 1, 2018. Submitted by Jason Horton on Jan. 7, 2018. We examined it but we decided not to recommend it based on it's lower ratings - you can see the current Zoom A3 Ratings here. Submitted by Jason Horton on Dec. 12, 2018.